Preparations are well underway to move the Sarjeant Gallery Te Whare o Rehua Whanganui’s nationally significant collection to its new temporary home at Sarjeant on the Quay – thanks largely to the gallery’s new team of Collection Transition Assistants. 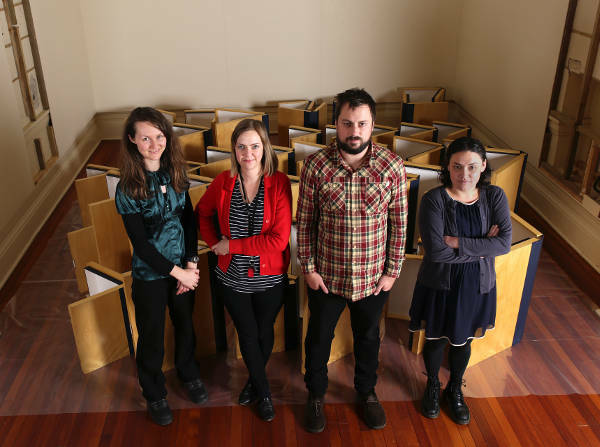 The team – whose temporary roles have been supported by funding from the New Zealand Lottery Grants Board – were recruited in April to assist with moving the gallery’s more than 5,500 art works to safety while the gallery’s original Queen’s Park building undergoes crucial earthquake strengthening and redevelopment work. Sarjeant Gallery Senior Curator Greg Anderson says it’s a massive undertaking to prepare and move a collection of the Sarjeant’s size and diversity and that – even with the transition assistants’ help – it’s likely to take around 21 months. “And it all needs to be done in a way that meets the highest standards of care to account for the importance and worth of the collections,” says Mr Anderson. “We took care to recruit people who have a balance of practical and academic experience and a passion for art, as well as specific experience with collection moves.” Wanganui born Jessica Kidd had recently graduated from Massey University with a Post Graduate Diploma in Museum Studies. Jessica was well familiar with the Sarjeant collection having been a regular volunteer at the Sarjeant Gallery during the course of her study. Further relevant experience had been gained whilst she was employed on a short term contract with the Whanganui Regional Museum working on their WW1 collection. Ben Davis and Te Maari Barham (both originally from Taranaki) relocated here from Auckland leaving museum and gallery roles especially to move to Whanganui to take up the Sarjeant positions. Kimberley Stephenson, (originally from Wellington) left a position at the MTG Hawke’s Bay, also having gained experience with the moving of a collection in that Gallery’s recent refurbishment. “We had a hard time choosing four successful candidates as we received nearly 130 applications – many of them high calibre – from people across New Zealand as well as overseas. We even had people apply from as far away as South America, Canada and Japan. “The fact that people from around the world would jump at the chance to move to Whanganui, New Zealand to take up a temporary role to help move the gallery’s collections is yet another clear indication that the Sarjeant and its collections are recognised and valued far and wide. And it’s fantastic that the gallery’s interim relocation has attracted four highly-skilled and motivated people to come live and work in our city. “With their help we can ensure the collections are re-housed safely in purpose-built storage racks within a suitably controlled environment, rather than remaining at risk in the uncontrolled environment of the original gallery’s basement. Then we can get started on another major task they’ve been recruited to help with – to enter the entire collections’ documentation onto Vernon CMS, our computerised collection management system. Once this is complete, we’ll have greater access to the collections and their documentation than ever before.